‘To all the supporters and friends of Tiverton Balloon Festival we are pleased to say that having initially thought that it would not be possible to hold an event this year due to The Queens Jubilee and 2012 Olympics taking up the time and energy of volunteers and supporters required to help organise and conduct our event, that following tremendous demand from mainly local people and offers of help, we have looked again at the possibility of 2012. We have had positive discussions with potential site owners and interested parties and we are pleased to say that there is now a good possibility that we will again be organising a balloon festival at Tiverton in 2012, provisionally over the August Bank Holiday weekend. There are still a few details to finalise, but with only 4 months to go we wanted to get out an early notice alerting visitors to this site. This notice will be updated as soon as further information is available. Or then again keep up with the news on the Festival News by checking out the website - http://www.tivertonballoonfestival.co.uk/. 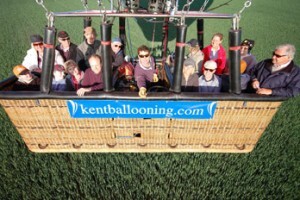 Caught on camera by Mike on one of his many flights over the Kent countryside, in the Spitfire Balloon, is this amazing picture of the biggest chap ever to fly in a hot air balloon, unless you know different. Amazing. For those inspectors wishing to get a rating permitting them to inspect and release to service special shape balloon envelopes the Technical Office of the British Balloon & Airship Club (BBAC) has just issued their new training procedure for special shaped inspectors! Copies of the document, BBAC-TC-069 iss 1.0, outlining the procedures are available in pdf form from the BBAC Chief Technical Officer. cto@bbac.org. Yet another argument for banning smoking in public places has come from Armenia. The accident happened at a political rally held by the Republican Party ahead of the elections in Yerevan, capital of the ex-Soviet Republic. It would appear that the ruling party’s planned balloon release from Republic Square went disastrously wrong when the balloons exploded after the hydrogen with which they were filled was ignited by an errant smoker. Greg, who used to crew with us at the County Shows, used to burst small children’s promo balloons as they passed with his cigarette, especially if they had Lloyds Bank emblazoned on them. These promotional balloons were decorated with the ruling party's election slogan "Let's believe in change". Not really synonymous with Armenia! 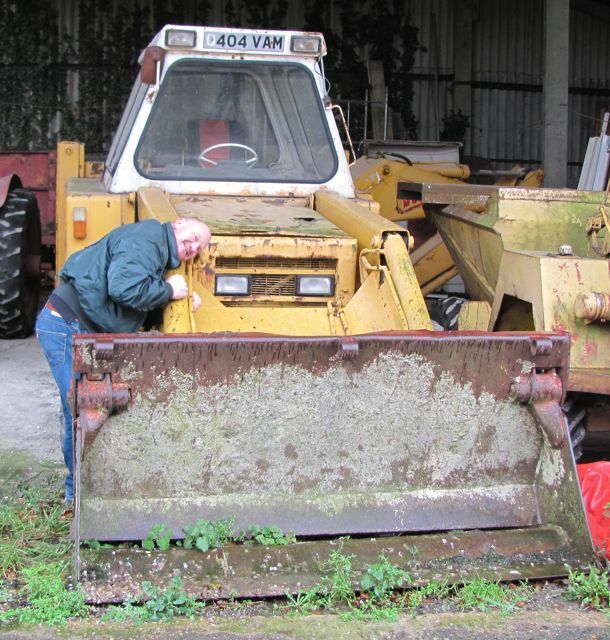 If you drop stuff off at the workshop no longer will you be able to leave it ‘behind the digger’. The trusty old JCB 3D has been sold. No, surprisingly, not for scrap (although that would have earnt more) but to that very adventurous balloonist ‘Whoa’ Gary Davies. Gary has always been a fan of JCBs and, ever since seeing the rare top of the range (in its day) 3D at the farm, has yearned to own it. 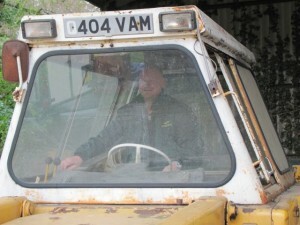 It is rumoured that Gary, better known for flying further and faster than most, probably has the largest collection of JCB and digger memorabilia (apart from JCB) in the country and now he has added a full-size model. Gary got his man (with a very big van) well early Friday morning to collect it. We’d had fun the week before getting the main hydraulic ram back inside the main boom and then Pete Brown spent a few hours pouring copious amounts of hydraulic fluid into the system until finally the rear actor and steering came back to life. Driving blind up the steep ramp onto the low-loader PB announced that loading all went well despite a fair amount of typical vague JCB steering. Although pretty tatty the old girl did work well and had done a fair bit of work around the area, including digging a pond that HS2 will cross by viaduct, until a few years ago when the seals in the main ram gave out. Like a wounded dinosaur Pete managed to coax it back to the barn where, with the aid of Stormin Normin the trusty fork lift, it got parked up. It was typical of Gary that he had half an idea that he’d drive it back to Peterborough. There was a list of reasons why he shouldn’t that stretched nigh on the length of the journey but focused mainly on the fact that if stopped the book that would be chucked at him would have required lifting by the back actor before being dropped on his head. “I reckon I could do it in four hours”, he confidently said. Most of Wendover fell about laughing. It was therefore with great relief that it left by lorry, however the driver said Gary had work for it on the way back! Over the next year or so Gary hopes to fully restore it to its former 1970s glory. Essentially everything is all there including (rare for a JCB) all the glass so apart from being a mammoth task it should be reasonably straightforward. With the big back actor and ram it will be ideal for heavy ditching work in and around Peterborough. Now what else can we find to flog him!! To get an idea how it will eventually look check out http://www.classic-combines.com/jcb3d11.html. Far more interesting than the CAA’s G-REG because it just has pictures, the new g-dash website is now (almost) fully live with a completely revamped look. Grahame Bann’s aim is to eventually have an individual page for each balloon on the UK register, however that, he says ‘is a project for later!’ but for now a second domain, balloonregister.co.uk, has been added to better represent the site content. Last week saw some familiar balloons drop in for inspection. www.kentballooning.com/’s Mike Spice turned up with G-BVCA our old Unipart Cameron N-105. We sold this to Mike last year to replace his old Chunnel Balloon. This was the Unipart Balloon Club envelope that our very own webbybloke Barry Conway used to operate after it did a spell on the circuit. Later that same week, Martin Freeston and Sandi Mitchell turned up with two of their balloons. G-BWAO a 1995 Cameron Concept 80 originally supplied to Dave Partridge’s old company Air2Air in Bristol before ending up with Graham Bell from whom they purchased it. The logbook contains some famous names like Piers Glydon, Richard Turnbull and Chris Monk. The other envelope in for a check-up was G-BXUU a Viva 65 that once belonged to Deli Gray-Fiske. Deli was an airline pilot for Danair if I recall and amongst other things flew Comets. The last time we saw her she was awaiting the AA to rescue her and her Edwardian car in Wendover High Street! She’ll probably turn up at The Chiltern Hills Rally in a week or two. You can check out Martin and Sandi’s balloon collection at http://modelballoon.co.uk/. Finally after the statuary 12 months me ‘orse Ruby has finally foaled. Following a brief respite in the weather she produced a fine filly sometime after ten in the evening on Saturday 5th May. Our Mary has been living in Frank the Lorry for the past month having parked it up so she could keep an eye on Ruby’s stable! Well, as is usual in such cases, she went up the house for a bit of supper and when she got back there was the new arrival. Although clearly very fit and healthy it struggled to get the hang of the food supply so eventually after a few hours of coaxing with no luck the vet was called. Following a heroic struggle we finally managed to tube the little (not so) thing and get a belly full of milk down. It has to be said that trying to pin it down definitely demonstrated that it is certainly well feisty and seriously strong. Judging by the bruises to my kidneys which now appear to be in the same place, it is double-jointed as well! By sunrise the little cherub was suckling like a good’un posing aka giraffe to get the right angle. 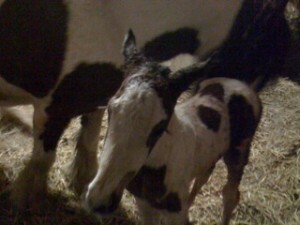 Mother and foal were doing well. 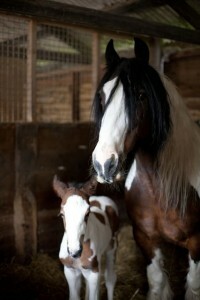 Horse milk in tea isn’t recommended. After a couple of hours kip we returned to the scene. 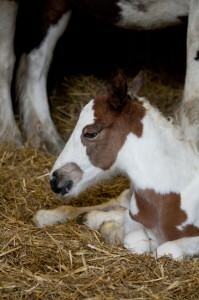 The foal, it is had been decided, is to be named Rosie Jem. We reckoned Rosie was a good name and so did Holly, Mary’s oldest. Ruby’s mother was a ‘Rosie’ and ‘Ruby and Rosie’ sounds OK. Ruby had clearly remembered the treatment metered out to Rosie and had decided that no more malarky was going to take place. She viewed everyone with suspicion. Rosie however was too busy sleeping, drinking or attempting to lay down under some sort of control. By midday the entire Team Wellick had all visited, a strawberry cream cake and champagne had been consumed and loads of oohs and arrrs made. 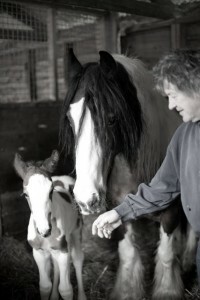 Even Barry website turned up and took some lovely piccies. Cheers.